If you're in Eugene and have a whole afternoon to be immersed in art, consider a visit to the Jordan Schnitzer Museum of Art (JSMA) on campus. If you have only the time it takes to down a cappuccino and a croissant, stop by the Metropol Bakery (in a minimall at 25th and Willamette), where the art exhibits are as fresh as the bread. Proprietor Donna McGuinness '69 and her husband, George McGuinness '71, have been collectors—gathering mostly the work of Northwest artists—for much of their lives. 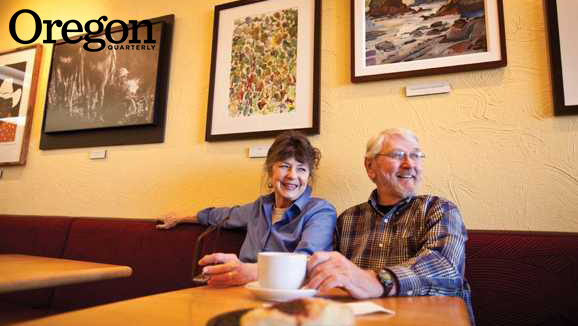 Many of the artists are friends they've met in their 40-plus years of married life in Eugene, including painter Linda Lanker and her late husband, photographer Brian Lanker, whose large-format group portrait of Metropol staffers is a permanent fixture behind the bakery counter. The McGuinnesses' collection also features works by their former neighbors, Eugene art world power couple Mark Clarke '59, MFA '65, and Margaret Coe '63, MFA '78. Each taught for many years in the university's art department and Clark served a long tenure as the chief museum exhibitions preparator and museum technician for the JSMA. Late last year, McGuinness dedicated one wall of the bakery's dining area to works for sale from Coe's Village series, but most of what you see on the walls—the portraits and still lifes, the landscapes and abstracts—comes from the McGuinnesses' own collection. Donna characterizes herself as a "talented amateur" with many interests—an English major who parlayed her love of cooking into a successful career as a baker and restaurateur; a textile hobbyist who became a respected weaver. In 1975, a significant commission for a large woven tapestry allowed her and George to take their first extended trip to Europe. Once back, she opened a charcuterie, and soon after, the Metropol Bakery in the Fifth Street Public Market, where she introduced generations of UO students to the baguette. After showing photos of the European outdoor café culture to skeptical city authorities, she added sidewalk dining to Eugene's eating options when she opened a third business, Café Metropol, in 1981 at the corner of Broadway and Pearl. In 1998, tired of running three businesses scattered across town, she decided to consolidate to just one location in south Eugene, and she and George opened a large production bakery with a smattering of tables in the entry, in case any customers cared to linger. Many did, enough that the counter has been moved back twice to make more room for tables and chairs. "Once we had just this one space," Donna recalls, "we started thinking, why don't we bring in some art from home?" Their house was by this time overflowing, with pottery, weavings, basketry, and sculptures scattered throughout, and framed paintings not only hanging on walls but leaning against the wall in stacks along a long corridor. At the bakery, Donna has room to display perhaps a dozen works, which she and George now select together, often starting with one painting and building the exhibit out from there. She changes the display on no fixed schedule, but rather, "when it just feels right: whenever people start to walk through and don't look at anything." Regulars can get alarmed when a favorite piece comes down, as occurred last summer when McGuinness loaned Big Hawk Stare, a large and riveting work by Newport artist Rick Bartow, to the Jordan Schnitzer Museum of Art. It was one of eight pieces the McGuinnesses lent the museum for its 80th anniversary show Living Legacies, featuring work owned by local collectors. "It was especially enjoyable to meet with the McGuinnesses," says Danielle Knapp, McCosh Associate Curator at the JSMA, "because of the stories they shared about their motivations for collecting and sharing art with the community through Metropol, and the patient, thoughtful approach they have taken to acquiring the works they most want." Donna credits a photography class she took from the late Bernie Freemesser (associate professor of photography in the journalism school in the 1960s and '70s), for, as she puts it, "teaching my eye to really look." Her husband gets credit too, she says, because he has a "fantastic eye." From the day they married, their home has been filled with art: not just framed paintings but snapshots, pictures torn from magazines, found objects. "Everywhere, art is just around," she says. With such a large and varied collection, the McGuinnesses have begun putting the brakes on further acquisitions. Or so they tell themselves—at this writing, a small coastal landscape rendered in rich reds and blues by oil painter Erik Sandgren is on display, purchased by Donna just one month prior. "Without art, life is pretty thin," George says. "It's so enriching. It's ennobling, too, don't you think?"